Fairmeadow Farm: Tuesday's Work Bee - Squash Harvest! 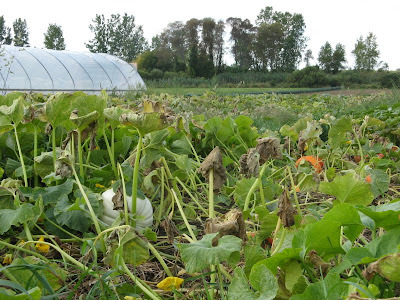 Well, despite the rainy forecast for tomorrow, the show (or, in our case, the squash harvest) must still go on! Hopefully a few of you will brave the elements (in appropriate rain attire) and join me for a couple of hours in the garden gathering up squash and pumpkins Tuesday afternoon. The work bee will take place from 1:30 to 4 pm....cross your fingers and toes that the rain stays away and it isn't quite as blustery as today! We actually had two hail storms pass through the farm this morning - thank goodness the Orchard Hill bunch and I could cram into the hoophouse in the garden for shelter! The spinach wasn't as lucky though (not being able to get up and join us) - some of the larger leaves are slightly worse for wear, but it did the best it could to withstand the pelting. Thanks very much to CSA member Ross Lemon for passing on a few photos he's taken around the farm recently! 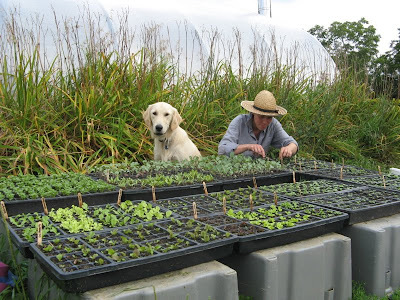 In today's post we have the pumpkin patch, the onions curing in the hoophouse after their harvest, and Caesar, Ken and Martha's puppy, helping me thin seedlings. I had to put this last one in since he's been quite the helpful farmhand this summer - he is an expert mouser despite not even being a year old, and offers fantastic moral support through all kinds of farm tasks (especially those related to possibly finding mice such as mulching and laying out old row cover). 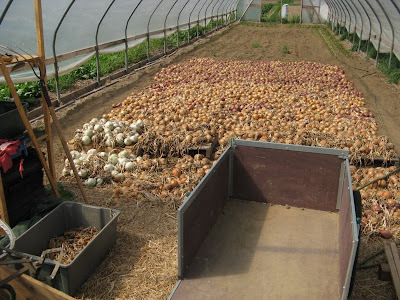 I can't believe that the last of those transplants went into the hoophouse last week - only a few more late salad greens to seed now, and all the planting is finished for the year!